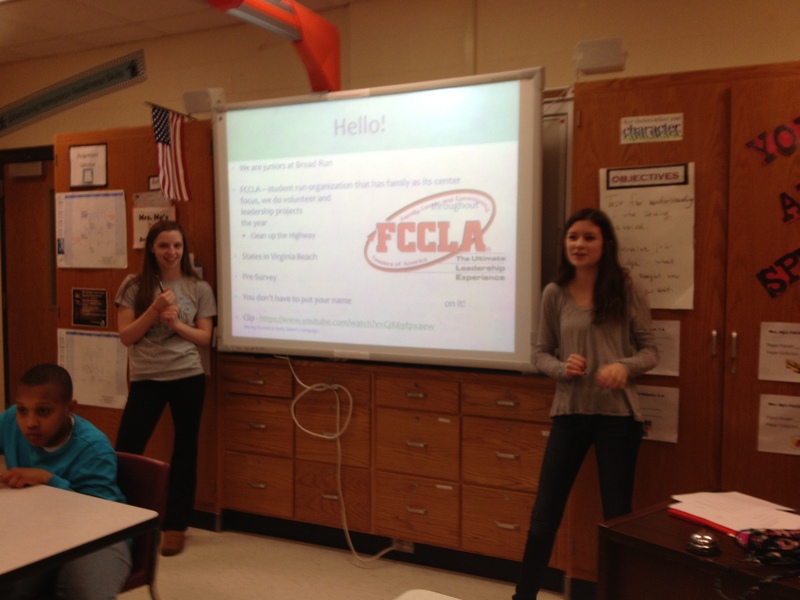 My name is Marley Puckett and my friend, Emily Adams, and I are from Broad Run High school in Ashburn, Virginia and we are in FCCLA, which is a student run organization with its main focus as family. We complete community service and leadership projects in our chapter throughout the year. I am currently the Vice President of Star Events and Emily is the Vice President of Community Service in our school chapter. We are doing a project at our school on the awareness of depression & anxiety, particularly in teenagers because we know the pressures of school and how much it can impact us. Our goal for this project is to create as much awareness as possible on depression and anxiety. So far, we have made five slides of facts about anxiety and depression that we showed at our school for a week. Each day, a slide was posted and said on our school announcements along with the anxiety & depression hotline. We ordered three hundred wristbands that say, “When nothing goes right, go left” as a convenient reminder that there is always a way out of any situation that someone is in. We have been giving them out around our school and in our classes. We intend to continue handing them out until we run out. We also presented an informational PowerPoint to an after school program all about anxiety and depression at our local middle school, Farmwell Station. The presentation includes the following: signs and symptoms, forms, causes, ways to help a friend and ways to help yourself as well as charts and pictures that go along with it. In addition, we have made social media accounts consisting of facts, pictures, quotes, videos, and statistical charts with the hopes of creating even more awareness about these disorders. Our goal is to get 100 “likes” on our Facebook and 100 followers on our Twitter page. Our Facebook is “Depression & Anxiety Awareness” and our Twitter is @aadawareness. We also made a website that you can visit at www.anxietyanddepressionawareness.weebly.com, where we post our project’s events, facts about anxiety & depression, our journey through FCCLA, and partners/sources that we have used. Lastly, we will be holding a fundraiser at our local Chipotle on May 14th. We will be raising money to go to the Anxiety and Depression Association of America. We will be competing in the FCCLA State Conference in Virginia Beach April 3rd to April 6th, where we will be presenting our project to judges and hopefully advancing to the National Conference in San Antonio, Texas in July! Be sure to follow us on our social media accounts! Please feel free to email us at anxietyanddepressionawareness@gmail.com! This entry was posted in Guest Post and tagged anxiety, anxiety awareness, awareness, depression, depression awareness, mental health, mental illness. Bookmark the permalink.